The week of September 11th, 2001, defied description. Like millions of other New Yorkers, our family was glued to our television set. We were lucky enough to be spared direct loss. However, one of our friends is married to a NYC firefighter so we worried about him. By Wednesday we found out he was all right, but many of his fellow firefighters never made it out of the World Trade Towers. When Saturday morning dawned it was time for our children to get back to their soccer games. I wasn’t able to go because I was attending a baby shower. When I came downstairs, ready to leave, my 11-year-old daughter announced that she was going to ask for donations to support the Red Cross during her sister’s game. She had it all planned. She had a plastic bag with the Red Cross logo on it. She took a table and chairs, and a friend to help. I thought she’d collect a few dollars which we could donate. When I arrived home, I was stunned to see that she had collected $218.62. This inspired both her and her sister. Sunday morning, they collected another $17.00 from people on their way to church. Sunday afternoon, it was my 7-year-old daughter’s turn to try her hand collecting donations. 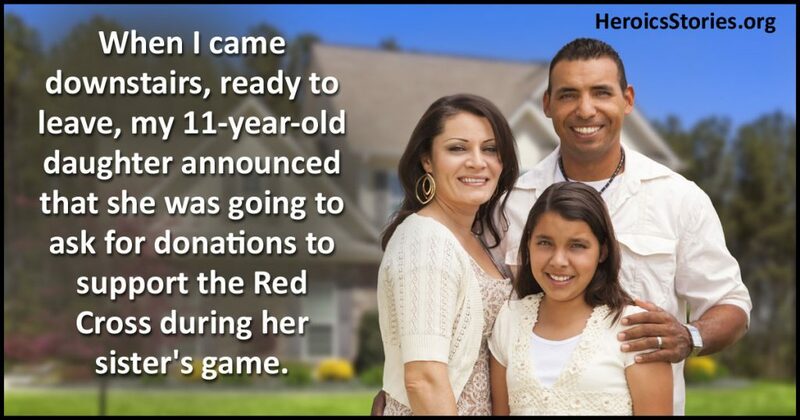 At her sister’s soccer game, she was able to collect another $78.00. Finally, on Monday the girls set up a lemonade stand, offering free lemonade in exchange for a donation. Another $47.00 for the pot. When all was said and done, they collected $363, which my company will match. Is it a huge sum of money? No — but my children were not finished. I work near the firehouse of Ladder Company 24, where Father Mychal was the Chaplain. Fr. Mychal lost his life administering last rites to a dying firefighter on September 11. Our church had special prayers for this wonderful man, thus giving his name more meaning to my girls when I explained where his firehouse was. We wanted to do something for his brave partners. We spent Sunday baking cookies, muffins, coffee cakes and brownies to deliver to New York’s finest. A simple gesture, but one where my kids could say they helped real people. When I delivered them, I was humbled by the grace with which the firefighters accepted our offering. Across America, our children are mobilizing to make a difference. Biking through my town, I saw kids organizing lemonade stands, bake sales, and car washes. No doubt they held other fundraisers that I didn’t see. I have never been more proud of my children than I was that weekend. I have no doubt that other parents felt the same way. The hope my children inspired in me is worth millions. Very touching. I remember reading that Fr. Mychal lost his life while administering last rights to a fallen firefighter.